Rebecca Jago and her dun Appaloosa X Warmblood mare ‘Rowesbrook Indiana’ are a match made in heaven competing in everything from Riding Club competitions to showing, dressage to music and British Eventing. Fed on Equerry Conditioning Mash, Indie as she is known at home looks a picture of health all year round and has been fed on Equerry for more than 12 months. Indie is a 10-year-old, 15.1hh homebred mare out of another of Rebecca’s homebred mare’s Sunspot Tia Maria. 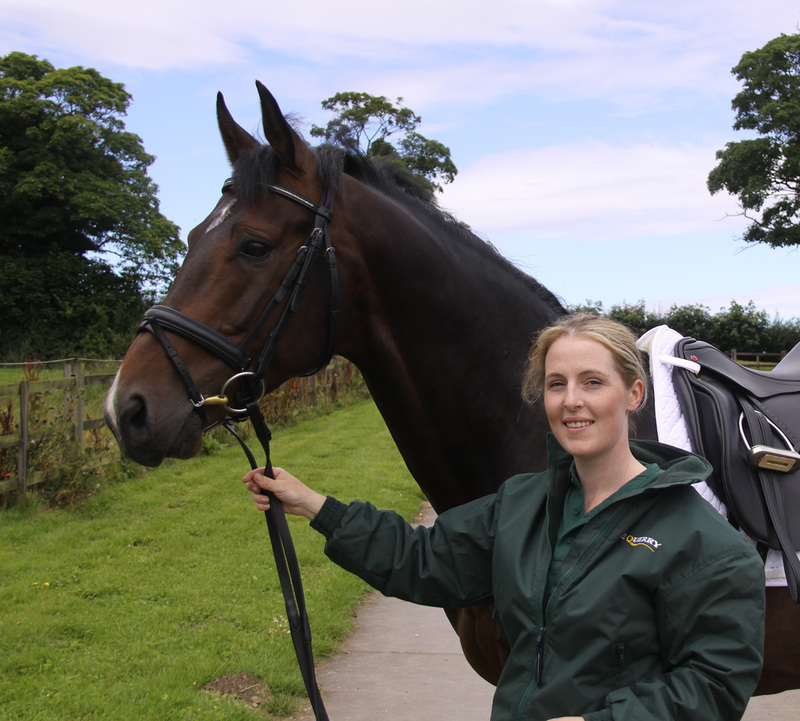 Rebecca has always had a passion for horses since a young age and alongside her interest in breeding horses she trained as a riding instructor. However, Rebecca went off to University to become a teacher and now juggles being a full-time classroom teacher with taking part in as many competitions as she can fit in. 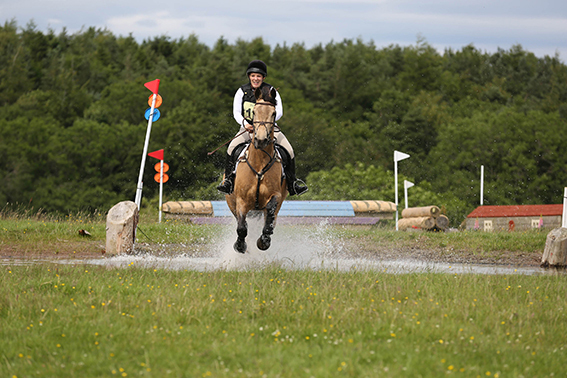 Rebecca competes in all disciplines from Riding Club Championships to The Royal International Horse Show and British Eventing, with Equerry Conditioning Mash keeping Indie performing at and looking her best. As a duo their most memorable accomplishment was competing and qualifying in the Dressage to Music held at Bury Farm in 2016, they rode alongside another dun horse with a routine entirely to Disney Music which both Rebecca and Indie thoroughly enjoyed. Before feeding Equerry Conditioning Mash, Indie was fed straights such as barley and has since seen a huge difference. The Equerry Conditioning Mash enables Indie to stay in excellent condition whilst having enough fuel to keep her competing. Said Rebecca: “I swear by Equerry Conditioning Mash! It has helped Indie not only look great but perform her best throughout demanding times. The Equerry Conditioning Mash is a quick-soaking mash for horses that need to gain weight and condition. It is low in sugar and starch and is ‘Non-Heating’ and includes highly digestible fibre sources including sugar beet. It has a good level of protein for muscle development and topline and the high oil level and linseed in the feed helps promote condition and a shiny coat. The mash also includes a high level of yeast for a healthy digestive system and has added vitamins and minerals including magnesium. Equerry Minty Treats make the perfect reward for your horse or pony and have a lovely spearmint flavour. And these delicious healthy treats now come in a new 20kg size – ideal for larger yards or sharing! A healthy treat option, Minty Treats are fibre-based nuggets, low in sugar and are ‘Non-Heating’ and cereal-grain-free so they won’t cause any problems or ‘fizz’. They can be fed by hand, in a treat ball or added to feed to tempt fussy feeders. Equerry Minty Treats are great for when your horse deserves a little reward. 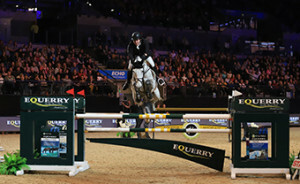 Along with the launch of the new 20kg size Equerry is also running a special promotion throughout February and March. 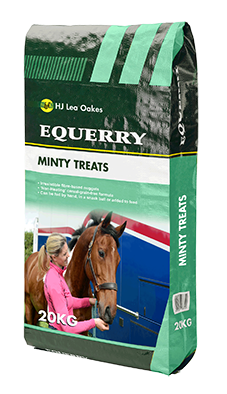 Buy four bags of any Equerry product at your local store and get one bag of Equerry Minty Treats absolutely free. The Equerry horse feed range includes Equerry High Fibre Cubes, Equerry Cool Mix, Equerry Horse & Pony Mix, Equerry Horse & Pony Cubes, Equerry Conditioning Mash, Equerry Conditioning Cubes and Equerry Veteran Mix. 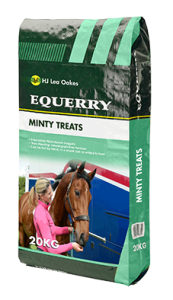 Equerry Minty Treats 20kg are £11.50. 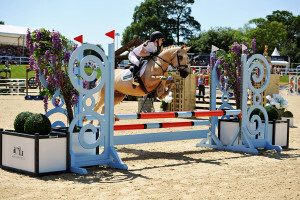 To find out more about the Equerry range of horse feeds visit www.equerryhorsefeeds.com or telephone 01845 565640. Jake Saywell showcased the best of young British showjumping talent when he claimed a thrilling victory in the Liverpool International Horse Show Under-25s Grand Prix. The class, sponsored by Equerry Horse Feeds, saw a high-class entry assembled, including the likes of Jake, Robert Murphy, Jessica Mendoza – Great Britain reserve rider at the 2016 Rio Olympics – highly-rated Harry Charles and his sister Sienna. Eleven combinations from 23 starters made the jump-off, and it was Harry Charles who set the pace from an early draw when he clocked 31.15 seconds with Victor. That time looked like it might be quick enough, but Robert Murphy and Del Fuego had other ideas, with Robert punching the air in celebration after going more than a second quicker. But the stage was then set for Jake and Havinia van de Roshoeve, and they did not disappoint, clipping 33 hundredths of a second off the leader’s time to land a £2,000 top prize. “The calibre of riders we have coming up in Great Britain is fantastic,” Jake said. “It’s a real credit to us as a country, and tonight it made for a very good class. “The jump-off was fast. The first round wasn’t an easy track, so 11 going through said everything about the standard. “Harry looked fast. I know my mare very well – she is very careful – so I knew I could be there or thereabouts, and then I heard Rob’s time, which was going some again. “My horse is a class horse, a very careful jumper. The way she is jumping, and aong with some other horses I have, who knows for 2018. When do you hang your Christmas decorations? Fiona does most and normally starts in the summer but I do mine on Christmas Eve. Do you do anything on Christmas Eve or have any family traditions? Just sit down to a big meal and play games afterwards, although this normally gets way too competitive. We each take it in turn to open one present, that’s probably why it takes us all day! Is there anything you have asked for this Christmas? Rotisserie attachment for my BBQ. Do the yard really early then come in and cook a big breakfast with champagne for everyone. Start opening presents then family get nibbles ready for lunch while we skip out. We spend the afternoon opening presents and then finish off the yard before coming in to start cooking Christmas dinner. After dinner we normally just chill out in front of the television and the fire. Do you spend Christmas Day with family, how many people sit round the table? Yes, there are normally about 10 of us. Do your pets get Christmas presents? Yes, probably more than me. How will you spend New Year’s Eve? At home with the dogs, we give the staff Christmas and New Year off, so it means we are on yard duties. Live every day to the full. Real or Fake Christmas tree? Real. Christmas Pudding or another dessert? Christmas pudding. Favourite Christmas Carol? Good King Wenceslas. Tinsel or no tinsel? Tinsel. What part did you play in the school nativity? A wise man. If you could kiss anyone under the mistletoe, who would it be? Anyone who offered to do my share of the mucking out. Are you on the naughty or the nice list? Both. Turkey, goose or vegetarian option? Turkey. When do you hang your Christmas decorations? About a week before Christmas. When do you do your Christmas shopping? I pick things up all year as I see them and then have a mad panic a week or so before when I still need to find something for someone. Do you do anything on Christmas Eve or have any family traditions? I try and meet up with friends for a few drinks. What is your favourite part of Christmas dinner? I love food so all of it! But I particularly like sprouts with chestnuts, bread sauce and pigs in blankets. Do you have any Christmas traditions? Eggs Royale for breakfast. Is there anything you have asked for this Christmas? An indoor arena, horse walker and a gallop. If I got any of these I would be delighted but failing that a soup recipe book and a nice casual coat. What is your horsey routine on Christmas Day? I get up early and ride a few before heading back to the house for a yummy breakfast and to open presents. Then we head to a lunch with family. Back to do the horses in the evening and then chill out in front of the television. How do you spend Christmas day? With my mum and her husband’s family. They take it in turns to host the day. Do you spend Christmas Day with family, how many people sit round the table? Yes, there are usually around 15 to 20 of us. Do you treat yourself to a Christmas jumper, if yes then what design is on your jumper this year? I got one last year for the first time and it had an elf on it. 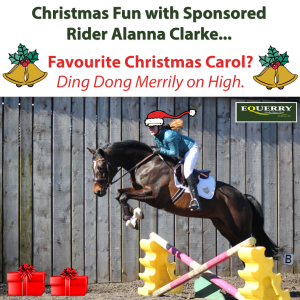 Do you go for a Christmas hack? Not really. What do you do on Boxing Day? Go to the local hunt meet. Do your pets get Christmas presents? Of course, and they love opening them. How will you spend New Year’s Eve? We are hosting a Murder Mystery dinner party this year. What is your New Year’s Resolution? 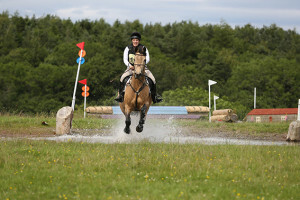 To get back eventing having missed half of last season having had baby Harriet. Christmas Pudding or another dessert? Another dessert. Colour co-ordinated baubles or not? Colour co-ordinated. Tinsel or no tinsel? No tinsel. What part did you play in the school nativity? An Angel. If you could kiss anyone under the mistletoe, who would it be? My husband of course but if he’s not available Elvis (Luke Pasqualino) out of Our Girl would do or Scott Eastwood. Favourite Christmas film? Let It Snow or Love Actually, it’s a tough one! Are you on the naughty or the nice list? NICE! About a week before Christmas normally. My Gran comes to stay and we do them together. Everything gets done in a panic a week before Christmas. We leave out Reindeer food and Father Christmas always has a Brandy left out for him, apparently its not that well known but that’s his favourite my Mum says! All of it! Except the Brussel sprouts, yuk! It’s the only time of year I’m made to eat them and the worst thing about Christmas! Opening presents before breakfast, I can never wait. What is your horse expecting this Christmas? Katrina my horse will be having some Equerry Minty Treats for Christmas. She never ate treats before we found these, and she can’t get enough of them. I would love a beautiful orange browband to match my orange matching set. What is your horsey routine on Christmas Day? It’s a normal day for the horses really, I think they like routine. Presents, breakfast, go to the yard, home to help cook dinner and watch some television, then back to settle the horses for the night and spend time with family. Yes, I normally spend Christmas at home with Mum and Gran comes to stay, then I go to Dad’s for New Year. Do you treat yourself to a Christmas jumper? Haha, I don’t but last year Gran got me one with a cat wearing a Christmas hat! Do you go for a Christmas hack? No, we all have a day off. What do you do on Boxing Day? I like to check out if the Bloodhounds are out and go along. No, they get spoilt all the time. I will be having a second Christmas with my Dad. To get a six pack, I really need to work on my core. Real or Fake Christmas tree? Fake. Christmas Pudding or another dessert? Chocolate cake. Favourite Christmas Carol? Ding Dong Merrily on High. Colour Coordinated baubles or not? Whatever takes my fancy. What part did you play in the school nativity? The Angel Gabriel. If you could kiss anyone under the mistletoe, who would it be? Jensen Ackles or Matthew Daddario. Favourite Christmas film? Home Alone. Are you on the naughty or the nice list? Ooohhhh I don’t know! Turkey, goose or vegetarian option? Turkey! When training on the flat, suppleness is a key element which should be carefully attended to and developed. A useful exercise which can significantly help to improve suppleness is leg yield. It is the first lateral exercise that is introduced to a horse and involves working on two tracks. During leg yield, the horse steps sideways and forwards at the same time. This means that the inside hind leg steps into the tracks of the opposite front leg. The inside legs step in front of and across the outside feet and the steps should be equal and in positive forward momentum. When training for leg yield it is important that the horse moves off the leg and learns the aid to step sideways. It is crucial that the rider positions the horse correctly to set up the leg yield. To start with turn the horse down the centre or quarter line and be sure to ride a few straight steps before turning your horses shoulders onto a diagonal line in the direction that you wish to travel. The half halt should then be used to make the horse’s shoulders wait and the outside leg can be applied for support. Simultaneously, the inside leg should be applied slightly further back, just behind the girth and should be used to ask the horse to step sideways. The rider should sit with a heavier inside seat bone, which the horse should learn to move away from. To clarify, the inside leg drives the sideways motion whilst the outside leg ‘guards’ and encourages forwardness. When leg-yielding, the horse should be straight through the body and give a slight flexion to the inside at the poll, which is encouraged by a gentle inside rein. 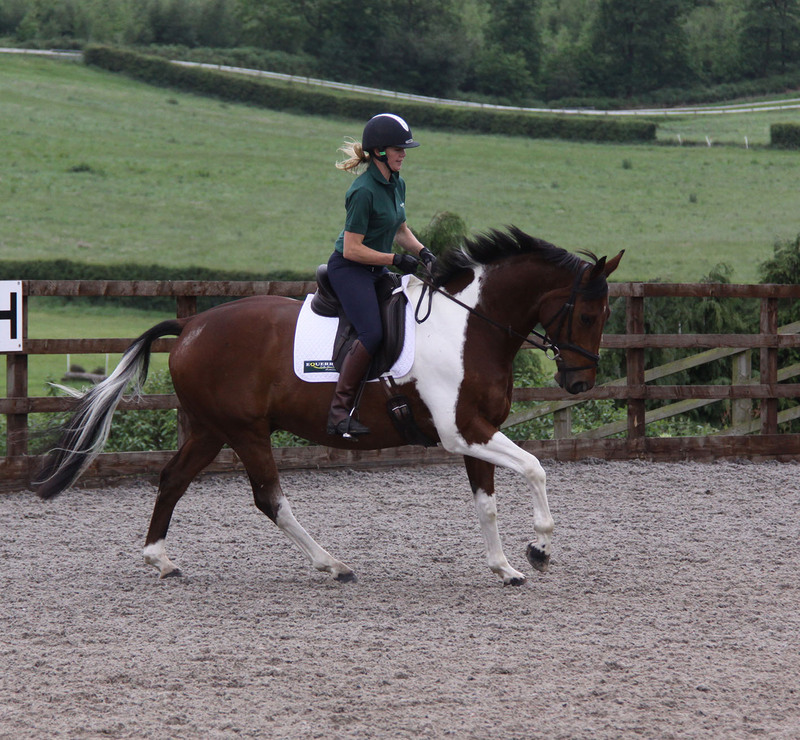 Here dressage rider and Equerry-sponsored Georgie Bennett talks us through a few simple flatwork exercises. Georgie explains how to ride half 10 metre circles and turns up the centre line. By the time you work on 10 metre circles or half circles your horse should be working in a rhythm and balance on 20 metre circles. The movements must be done without resistance or loss of balance or rhythm before the horse is ready to work on a small circle. The smaller the circle, the greater the demand for the horse to carry himself on his hind legs and engage the hindquarters. For this reason it is always better to work on 10 metre half circles before attempting a full circle. It is important that the horse does not lose his rhythm, shape or show resistance; better that the circle is a little larger until the horse is physically able to work correctly on a small circle. This is a good movement to practice to help improve your entry on to the centre line. 10 metre half circles can be performed anywhere in the school, but working from the centre line to the track ensures that the circle is not too big. However if you work from the boards to the centre line you have the option to then ride straight down the centre line or ride diagonally across back to the boards. When you have practiced several half circles on their own you can progress to two half circles. This is best done at ‘E’ or ‘B’ making sure that you do several strides down the centre line over ‘X’, changing the diagonal and balancing the horse before the change of rein. The aids and the principle of riding the half circle will be exactly the same as for a 20 metre circle. However you will need to be more engaged with this slightly more complex movement. After completing several of these movements you can than progress to full 10 metre circles. Turns up the centre are not only an integral part of the dressage test but they also play a part in the schooling and warm up of the horse. Initially the turns on to the centre line can be incorporated with your 10 metre half circles. Make the turn smooth, and look to where you will be going to make sure that you are accurate. It is important to be exact about the turn so not to over shoot the centre line. The horse must then go absolutely straight up the centre line without wandering. If the horse is pushed forwards between the rider’s hand and leg, he will be easier to steer and keep straight. When entering the centre line off the bend, the rider has to execute a half-halt to sit the horse on his hocks prior to the turn and so balance him, and then ride strongly forward with an even contact on reaching the centre line. In doing this, the rider creates enough push from behind to ensure straightness. This exercise encourages the horse to work more from behind, which is the ultimate aim when schooling. These turns onto a straight line can also be practiced by turning right or left at ‘E’ or ‘B’. With these turns there is not so much time to ensure that the horse is absolutely straight so the rider must be clear and positive with the aids. When changing direction by this method, change the flexion at the poll over the centre line and do not allow the horse to swing his shoulders or hindquarters. When you have practiced this several times you can add halts to your exercise. It is often a good idea not to halt every time you proceed up the centre line as the horse will begin to anticipate the movement. Young Scarlett Cox-Lomas has the drive and ambition to be a future star. 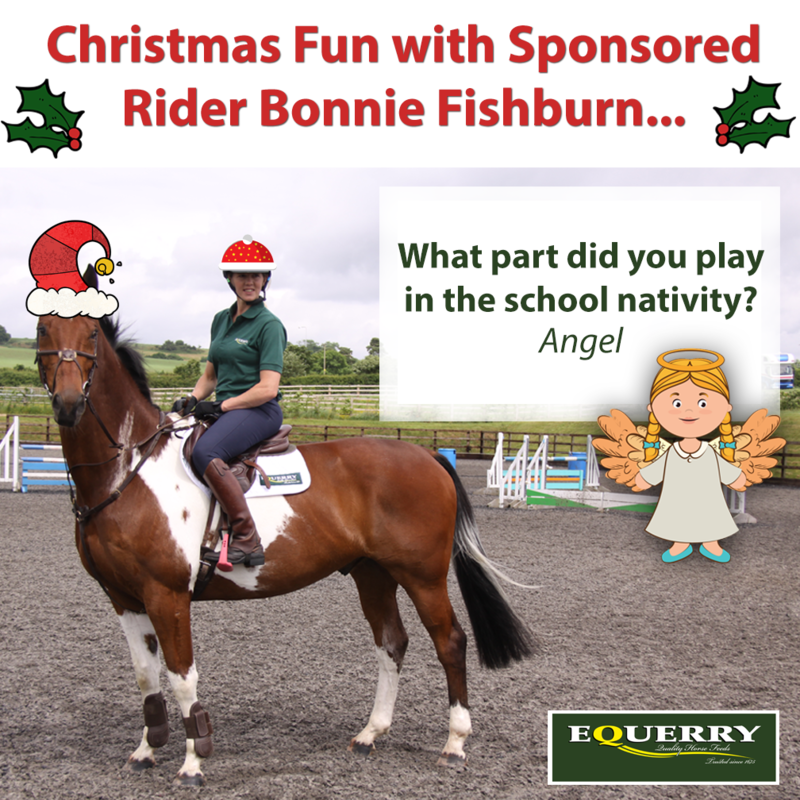 Here we catch up with the Equerry Horse Feeds sponsored rider to find out more about her determination to succeed. Without doubt, producing ponies is Scarlett Cox-Lomas’ first love! To say she lives and breathes riding is an understatement and the more hours spent in the saddle the better for the 12-year-old from Cheshire. With six ponies to ride and produce Scarlett’s down time out of school is fast and furious and she is probably most well-known for riding the palomino mare, Lillibet. Now 10, the 128cm pony arrived as a poor and untouched three-year-old and the partnership has developed together, hitting winning form this season. At The Equerry Bolesworth International Horse Show in June, Scarlett and Lillibet took second in the Mini Major Relay while just six weeks later they went on to win the same class at CarFest North, also held at Bolesworth Castle. “When Lillibet arrived she struggled with her weight and had so much growing and maturing to do. She is half Arab, half New Forest and was very slow to learn so it did mean I had to be patient and understand that producing and training ponies takes time and can’t be rushed. When she arrived the biggest thing we noticed was that she really lacked personality and didn’t really seem to enjoy life a great deal. Lillibet was actually quite ugly and not very flexible but my mum Emma set to working on her and after months of patience and time she started to improve and turn the corner. As her confidence grew so did her love of life and in the last few years she has just been a star and we now have a fantastic bond whether training, competing or just spending time together. Winning at CarFest North was just fantastic and we now compete in 133cm Working Hunter Pony classes as well as show jumping, eventing and dressage. 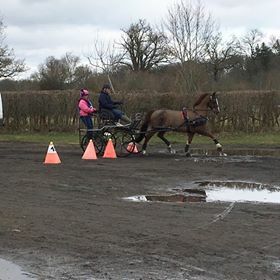 Our dressage has really taken shape and I am busy working towards competing at affiliated level. Scarlett’s latest ride is the 138cm show jumping pony, Spider’s Dance, owned by Amanda and Amy Cornforth. A former HOYS contender, the Irish cob had started to stop when show jumping, following an incident which dented his confidence. But thanks first to Amy, improving their bond and relationship and more recently to Scarlett taking her time to get to know and understand the 19-year-old, bay gelding their partnership is going from strength to strength. 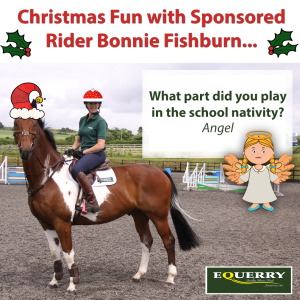 When not out competing Scarlett enjoys her role as an Equerry Horse Feeds ambassador and also schools and produces other ponies to assist with the costs of competing on the pony circuit. 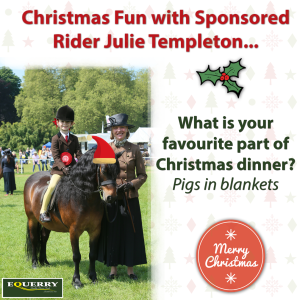 “I wouldn’t want to do anything else, riding is my life and I feel very lucky to have brilliant support from my family and sponsors,” she added.